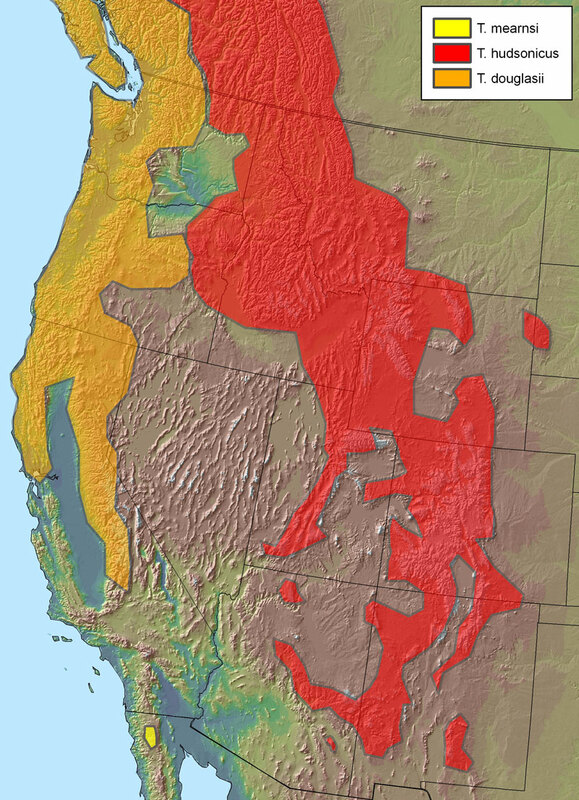 Geographical distribution of the genus Tamiasciurus in the western U.S. The Mount Graham red squirrel (Tamiasciurus hudsonicus grahamensis) is a subspecies of the North American red squirrel (Tamiasciurus hudsonicus). 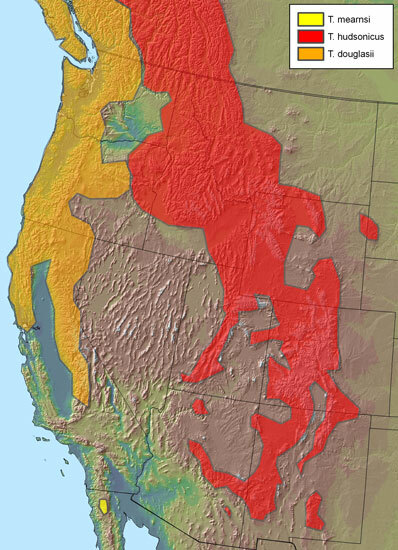 The geographical distribution of the North American red squirrel ranges from Alaska, the Yukon, the Northwest Territories, and Quebec southward as far as the Rocky Mountains of New Mexico and Arizona in the west and the Appalachian Mountains of South Carolina in the east. 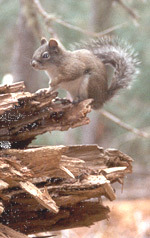 The Mount Graham red squirrel, however, is found only in the Pinaleño Mountains of Graham County, Southeastern Arizona. With the exception of the flying squirrel, North American red squirrels are the smallest species of tree squirrel in North America. The squirrel measures about 30 cm (approx. 12 inches) from the nose to the tip of the tail and weighs about 225g (approx. 8 ounces). The fur on the back and sides of the red squirrel is brownish-red and the underparts are white with a black stripe separating the two colors. The ear tufts and the limbs are also brownish-red. They have a prominent white eye ring and the tail is brownish-red above and grey with white flecks below. While the Mt Graham red squirrel subspecies exhibits only slight phenotypic differences (slightly smaller body size and slightly narrower skull) than other red squirrels found in North America, genetic evidence does support the distinction of this subspecies (Sullivan and Yates. 1994. Storm over a Mountain Island. University of Arizona Press, Tuson, AZ). Red squirrels are diurnal (active during the day) although they may occasionally be active during the night. Activity patterns are strongly influenced by weather patterns; high winds, rain, snow, and low temperatures reduce activity. Red squirrels do not hibernate during the winter months and most activity during this time of year occurs during mid-day hours when temperatures are highest. In summer the squirrels are most active during early morning and late afternoon hours, and in the spring and fall activity levels are equally distributed throughout the daylight hours. Red squirrels are highly territorial and will vigorously defend the area surrounding their hoard of food by using territorial vocalizations and by chasing intruders away. They not only attempt to keep red squirrels and other competitors at bay, but also exhibit territorial defense behaviors against predator species. The most common territorial behavior is a vocalization called a chatter (or rattle) call. This vocalization serves to announce the presence of an individual to its neighbors, warning them to stay away and avoid costly aggressive encounters. Chatter calls are often used: when a squirrel first emerges from its nest, when it returns to its territory, after caching food or feeding, and upon sighting an intruder. Barks are most often given in long series, sometimes lasting for several minutes up to an hour. Squeaks are given in response to a potential threat and increase in intensity if the threat does not diminish. They often progress into barking sessions. Growls are most commonly heard during chases and fights over territories or females. Squirrels caught in live traps will also growl when approached. The squeak and buzz calls are the first calls developed by juveniles and are used to call to their mother. Red squirrels feed mainly on seeds of coniferous trees, but they also eat mushrooms, insects, bird eggs, nestlings and a wide range of other items. In coniferous forest habitats, red squirrels create "middens", which are the accumulation of cone scales and debris left from feeding. They typically only feed at one or two favorite places within their territory and the debris can pile up to considerable depths. The midden is used as a storage area, for caching cones, and it likely provides a cool, moist microenvironment which facilitates seed storage. The midden, the territory surrounding the midden, and the center of activity are vigorously defended from all intruders. Each territory (midden site) is occupied by a single squirrel, with the exception of females with young. 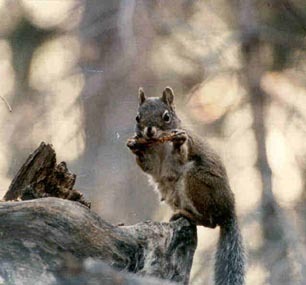 Midden sites may be occupied by a succession of different squirrels for decades. Cavity nests - are made inside hollow dead trees (snags) and appear to be the preferred nest type, especially for giving birth to and rearing young. Bolus nests - are constructed from grass, lichen, leaves, and sticks and are formed into a ball then placed on a branch or branches of a tree. Ground nests - Are located in underground tunnels, often tunnels left from a rotted tree root system. 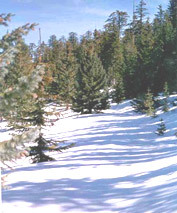 Nests are often constructed under logs covered with deep snow. These nests are only used for one winter and provide easy access to the squirrels' food caches as well as protection from predators and the weather. Red squirrels become sexually mature at about one year of age. The breeding season begins in midwinter, usually in February or March, and continues into summer. Females are in estrus for less than a day and may be pursued by and/or solicit the attentions of several males. 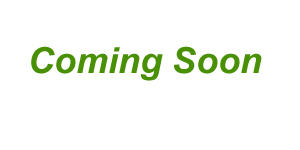 This activity often leads to raucous breeding chases involving many squirrels that may last for several hours. Females usually have one, or sometimes two litters per year, typically with 3-5 young per litter. The altricial young are born after a 35 day gestation period and are nursed in the nest for about 45 days before emerging. They may remain with their mother for several weeks or months before moving away to establish their own territories. In some instances the mother may relinquish a portion of her territory to one or more of her offspring, and move to establish a new territory herself. Juvenile mortality is high. In other populations about 50% of the juveniles will die before they reach the age of six months, and another 25 to 30% typically do not survive to the end of their first year. Once they establish a territory the average life expectancy is about three years. Predators include avian species (northern goshawks, sharp-shinned hawks, cooper's hawks, red-tailed hawks, Mexican spotted owls and great-horned owls) and mammalian species (gray fox and bobcats).